A woman witnesses a murder and is to be killed. An over-weight, over-middle-aged woman witnesses a murder and is taken by the killers to a remote area of California to be killed. She manages to escape and uses every fact she can recall from stories to survive. She follows a river which takes her to an abandoned cabin near a marijuana farm where she steals food to survive. Fran fears having to return to the "City" to become a witness, but more that than she fears returning to her own humdrum way of life. Over time Fran forms a kind of remote bond with the people on the farm and is drawn to one who reminds her of her own daughter. Fran finds that her adventure is less about her physical survival than it is about her emotional one. Two women, Indian and white, escape across the Great Plains. An older woman helps a young woman escape the police. 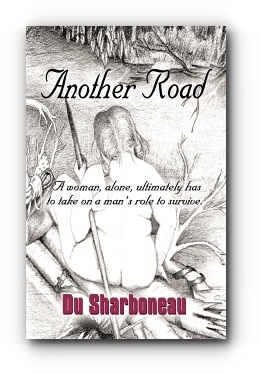 Du Sharboneau grew up in a family of women; her father was out there on the fringes somewhere. Divorced at the age of 28, she found the strength and courage, as did her mother and many other women, to survive alone and be both mother and father to her five children.